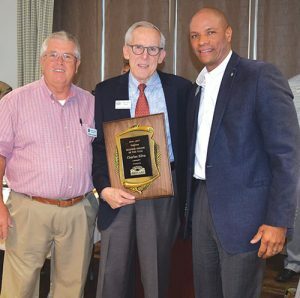 Charles Silva was named the Smyrna Business Association Business Person of the Year at the September meeting. Silva, who currently serves as secretary of the group had a long tenure as treasurer. Presenting the award are, left, Dennis Harding, last year’s recipient and Jabar Dozier, right, president. A native of St. Louis, Silva grew up in St Louis Missouri and spent most of his career as a banker, working his way up to bank president. After volunteering for the Arthritis Foundation, Silva headed the Arthritis Chapter of Eastern Missouri and came to the Atlanta area as CFO of the National Arthritis Foundation in 1997. He and his wife, Katie, have two grown children. 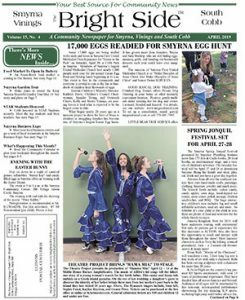 From the September 2017 issue of The Bright Side, Cobb County Georgia’s Newspaper covering Smyrna, Vinings, Mableton, Powder Springs and Austell, GA.